One of the most common reasons that people seek Biblical counseling lately is because they have recently attempted suicide or had suicidal thoughts. In a large number of these cases, the person needing counseling is a young lady around 12-14 years of age who has a recent history of cutting herself or doing other acts that result in self-harm. As common as this has become, it is important for Christians to seek medical and Biblical advice for those struggling with cutting and self-harm. What is cutting and self-harm? As the words describe, cutting is when someone takes a sharp object, usually a knife or razor blade, and cuts themselves, often on the arms or legs. Self-harm can be anything that someone does to themselves that causes harm. Self-harm does not necessarily always involve cutting, but despite what some people think, cutting always involves self-harm. 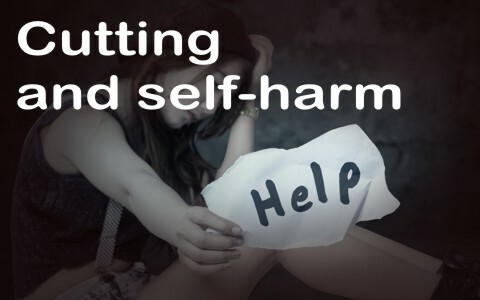 Self-harm could be other actions such as deliberately drinking or taking drugs with the intention of causing harm to themselves or out of a desire to get back at someone else for a real or perceived injustice. In most cases, cutting starts out with non-life threatening cuts that bleed and result in scars. Why do people do cutting or try to harm themselves? There are a million answers to this one. However, many people start cutting because of some heightened emotional or Spiritual conflict in their life. Many, especially young people, express a feeling that they do not have control over their life or a close relationship with people such as their parents or a romantic partner that they once had. More recently, I have seen cutting and self-harm result from situations when parents have taken away the cell phones or limited the computer time for their child. To the child, their whole world has been taken away from them and they cannot communicate with friends or romantic interests, which leads to extreme distress. Often parents will say that their child is just trying to get attention. While this may be true in some cases, it is not always the case. In many cases, the person expresses a strong desire to do something to demonstrate their power as well as experience the “rush” that comes with cutting. By this, I mean that most people that I have counseled that have done cutting have told of how the cutting resulted in a strong surge of energy and wave of pleasurable feelings when they cut. The most recognizable reason for this is the body’s response to the sharp pain of deliberately cutting themselves. When they cut, their pain receptors stimulate the nervous system. This results in the adrenal glands secreting adrenalin as part of a survival reaction. This adrenalin causes the heart to start racing and a host of other things that many call an adrenalin rush, much like one would experience when drinking a beverage with lots of caffeine. This rush also gives them a surge of energy, hence the reason why high caffeine drinks are called energy drinks. Like many daredevils and extreme sports enthusiasts who call themselves adrenaline junkies, they develop a strong attraction or adrenaline addiction to the rush that comes from their cutting. Unfortunately, this often leads to more drastic actions including suicide. Is there a Spiritual factor involved with cutting and self-harm? It is very common to find people with obvious demonic affliction actively engaged in cutting and often they pick their skin raw with their fingernails until it bleeds. Likewise, some go as far as cutting with another person and sharing each other’s blood. What should I do if I or someone I know is cutting or doing self-harm? Seek help immediately. If necessary, call 911 or go to an emergency room if you are engaged in or see someone else cutting or doing harmful things to themselves. It is important that professional help intervenes to prevent risk to life or limb. In many cases, the person will be admitted to a mental health facility, but it is important that they are somewhere where they will be safe. Likewise, seek out a competent Biblical counselor that has experience working with people that are involved in self-harm or have suicidal tendencies. Many times, I get calls from people whose loved one is in a mental health facility because of suicidal or self-destructive behaviors. Addressing the person’s Spiritual needs is critical in these cases so it is important that every attempt be made to coordinate this aspect of their care with their health care professionals. It is important for Christians to seek Biblical advice for those struggling with cutting and self-harm. Cutting is when someone takes a sharp object, usually a knife or razor blade, and cuts themselves, often on the arms or legs. Self-harm can be anything that someone does to themselves that causes harm. Many people start cutting because of some heightened emotional or Spiritual conflict in their life. The Bible gives us many reasons that we should not be cutting or trying to harm ourselves, primarily because we are children of God. Finally, if we know someone who is cutting we should seek medical and spiritual intervention right away. I have to say, I was saddened by your article. I am a church worker and part-time pastor who also wrestles with anxiety and panic attacks … and self harm. To literally demonize this struggle as you have (ie leave the impression to readers that this is a demonic struggle) belies an ignorance about the realities of mental health. I fully believe in the power of prayer and of God’s hand in the lives of His people; I also fully believe in the knowledge the Lord has given us, and using it to help heal the mind – just as we do with the body. Hello Paul. Thank you for your comment sir. I think you are not being fair to the author about this article. Dr. Williams wrote, “It is very common to find people with obvious demonic affliction actively engaged in cutting and often they pick their skin raw with their fingernails until it bleeds” and I have found this to be true. I have preached in a state hospital where some are incarcerated becasue of crimes but much of it was due to their mental illness. Yes, God can heal and does heal, but sometimes the mind cannot be healed without the assistance of medication. There are things like brain chemical imbalances but when the person has a mental illness and is not saved, they are open to demonic attack, and I have seen evidence ot it. If you broke a bone, do you not go to the doctor to have it set? The same thing for those who are experiencing mental illness. It is not alack of their faith but they need medical help. Jesus said the sick need a physician. I stand by what Dr. Williams wrote. I have experience as I preach to these who battle mental illness.